Part Used & Method for Pharmaceutical Preparations: The seeds are collected from April to June after the fruit ripens, and then they are dried in the sun. Functions: 1. To clear heat in the lungs and promote the dispersing function of qi in the lungs; 2. To moisten the intestines and move feces. 1. 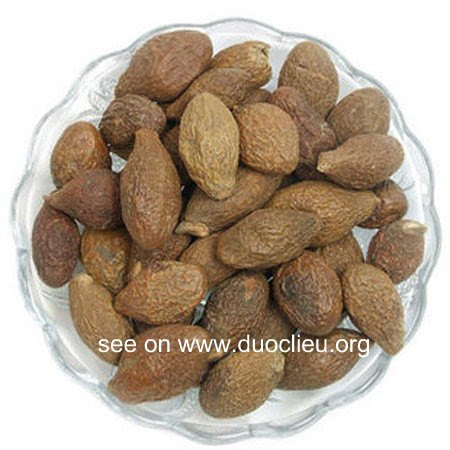 Failure of lung qi to disperse, resulting in accumulation of heat in the lungs manifested as sore throat, coarse voice, cough with yellow, thick and sticky sputum and sputum difficult to expectorate. Boat sterculia seed (Pangdahai) is used with Platycodon root (Jiegeng), Cicada slough (Chantui), Mentha (Bohe) and Licorice root (Gancao). The herb can also be used alone in boiled water as tea. 2. Constipation due to accumulation of heat. Boat sterculia seed (Pangdahai) is used alone in boiled water as tea, or it is combined with other herbs that move stool. Dosage: 3-5 g (The dosage for powder form should be halved).